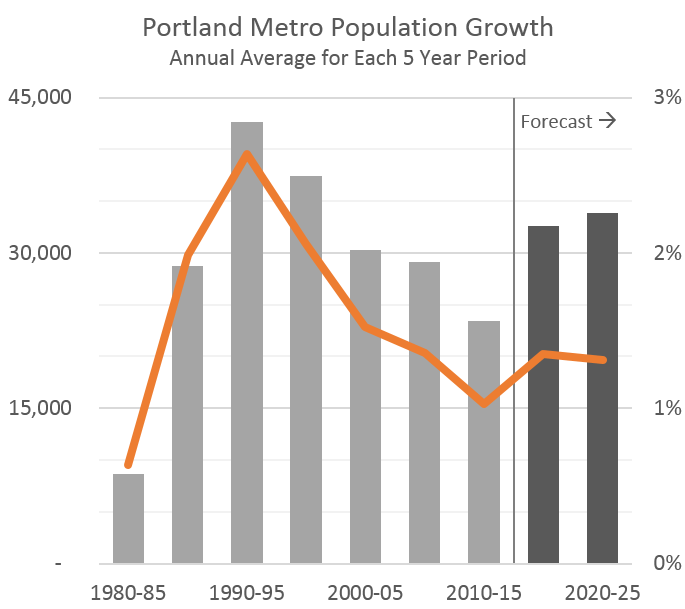 In a multi-post series focusing primarily on the Portland Metro, our office’s new housing work covered the bubble’s impact on ownership by year and by neighborhood in Part 1. Part 2 covered underlying trends in construction and demographics. 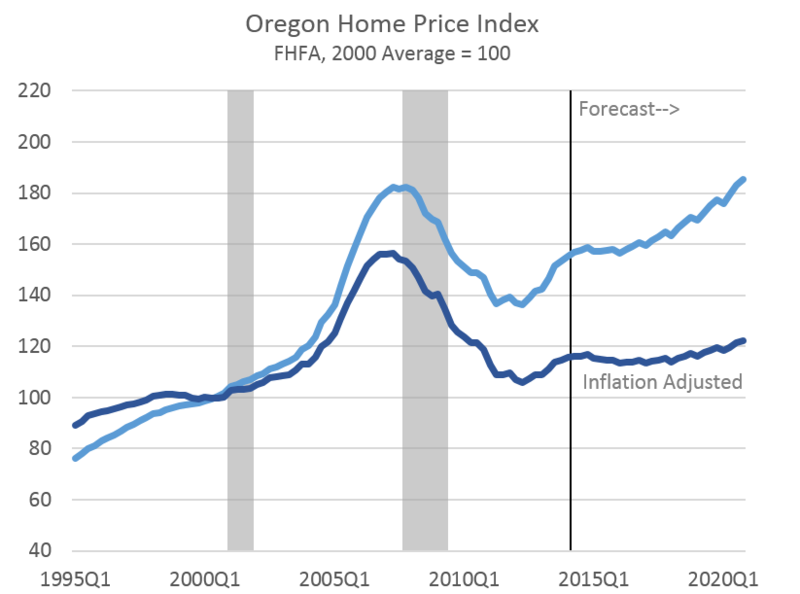 Part 3 went over housing affordability in Portland, while today Part 4 provides an outlook. The linchpin in the housing outlook for the region is population growth. It is no secret that Oregon, and Portland in particular, receive in influx of migrants each and every year. The magnitude of these flows are impacted by the economy and relative home prices, however even in bad times, people choose to live here. Moving forward, our office’s population growth rate forecast, much like our overall economic outlook, is lower than in past expansions, but that does not mean growth will stop. 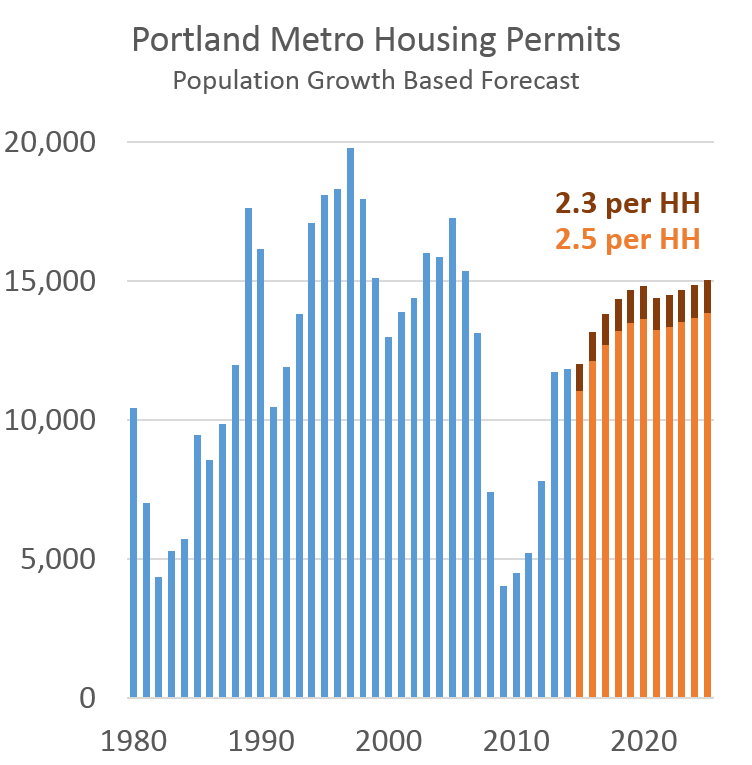 In fact, the number of new inhabitants in the Portland MSA is expected to be 30,000-35,000 each year for the next decade. Every one of these new residents will need a place to live. With population growth picking up, and more importantly household formation, the outlook for new construction is stronger as well. Based purely on the population forecast, the number of new housing units needed annually in the Portland area is about 13,000. This is based on the assumption of 2.5 persons per household, whereas historically the ratio of new construction to population growth has been lower at about 2.3 persons per household. That level of building would add approximately 1,000 more units per year, however that is not the baseline outlook. It does remain an open question as to the type of housing needed, or preferred. Economists and real estate experts agree that a larger share of multifamily is to be expected, certainly relative to the single family boom of the 1990s and 2000s. With credit availability still tight and a changed perspective on ownership following the bubble, expectations are that the higher share of the population in rental units will continue. Even so, there are some indications or warnings that the multifamily, rental apartment market in Portland may be overbuilt in a few years. From a population growth perspective, the region needs those units, however from a developer’s position, more units may eventually result in higher vacancy rates and/or lower rents. It will be important to closely monitor these developments and how the market adjusts. One key aspect here for ownership, particularly among the Millennials, is job tenure. Owning a home can be a good financial decision but it also anchors one to a specific location and involves large transaction costs to buy or sell. Should changing jobs more frequently, or the so-called gig economy, become more prevalent moving forward, then owning a home makes less financial sense as it does not provide the same flexibility as renting. Finally, our office’s outlook for prices is moderation. Historically home prices have increased slightly faster than the rate of inflation. Of course the housing bubble was a giant exception. Nevertheless prices today are, more or less, back to historical trends if you were to cut through the boom and bust nature of the past decade. As the economy continues to recover, with more employed individuals, household formation will likewise continue to pick up, along with overall population growth. Home prices are set to rise further, however the very strong appreciation rates are likely behind us. This does not rule out a near-term price correction in some markets, where prices may have risen a little too fast, too quickly. All of these dynamics are good indicators that the market is working, and getting more healthy. Overall, just as the economy is getting there, so too is the housing market. Part 1 covered the housing bubble’s impact on ownership. Part 2 covered underlying trends in construction and demographics. Part 3 went over housing affordability. Below are the full set of slides from our office’s housing work, including many additional graphs and figures.